The northwest corner of the Columbia Basin is a high plateau bordered by the deep gorge of the Columbia River on the west and north, the Grand Coulee on the east and southeast, and Badger Mountain on the southwest. Technically, the name Waterville Plateau is reserved for a relatively small section north of Waterville, but by tradition birders employ this term to designate the whole 30-by-40-mile area described here. Ice-age floods gouged out Moses Coulee, a north-south gash that bisects the plateau for more than half its length. The Withrow Moraine, which marks the southern extent of glaciation in the last ice age, crosses the southern part of the plateau in a southeasterly direction, from near Chelan to Coulee City. Monotonous wheat fields extend for miles on the unglaciated land to the south, providing little habitat for birds other than the many Horned Larks. Northward, the plateau bears abundant evidence of glaciation—large “haystack” rocks and piles of glacial debris, kettle lakes, and generally uneven, stony ground. Because of this rough landscape, farming has proved marginal, despite near-heroic attempts over the past century. Significant areas of former farmland are now set aside in the USDA Conservation Reserve Program, and shrub-steppe habitats are slowly returning to some of these. Bird species such as Gray Partridge, Greater Sage-Grouse, Swainson’s Hawk, Short-eared Owl, American Kestrel, and Vesper Sparrow benefit from the enhanced habitat. Federal budget cutbacks to this program, however, threaten many of these areas of “recovering shrub-steppe.” Many thousands of acres have reverted to active farmland in recent years. Awareness of the conservation value for birds of these government set-asides is growing, though. It is hoped the program will continue to protect these valuable habitats. The plateau is known for northern, open-country specialties in winter, including raptors such as Rough-legged Hawk and Gyrfalcon. Horned Lark (arcticola), Lapland Longspur, and Snow Bunting are usually findable among large flocks of the resident Horned Larks (merrilli). Raptors and shrub-steppe birds provide interest in the breeding season. Chukar, White-throated Swift (summer), and Gray-crowned Rosy-Finch (winter) can be found on cliffs and rockslides in upper Moses Coulee. Waterfowl, rails, and shorebirds are present seasonally at several lakes. A small population of Sharp-tailed Grouse inhabits brushy draws on the north slopes of the plateau, which descend toward the Columbia River. Orchards and ornamental plantings in and around Bridgeport support winter flocks of Bohemian Waxwings and finches. The Bridgeport Bar in the Columbia bottomlands is a great place in winter to sort through sparrow flocks and view waterbirds on the river. Birding on the high plateau can be difficult in winter, even hazardous. Always check the weather first. Avoid storms. Blowing snow obscures vision and quickly buries roads, and it may be miles to the nearest human habitation. Even in fair weather you may find dense fog atop the plateau. Stick to the main, plowed roads. During thaws, beware of soft shoulders and ungraded secondary roads, or you may find your vehicle up to its axles in mud. It is advisable to bring tire chains, a shovel, extra clothing, emergency food and water, cell phone, and sleeping bags on any winter trip. There is no single best way to bird the plateau. Much of it is served by a grid of gravel section-line roads, and the more you explore, the more birds you will see. Several consistently productive areas are described below, loosely grouped for convenience of presentation. Amidst the wheat fields 13 miles east of Waterville on US-2 is an intersection with SR-172. From May to July, pull off the highway about a quarter-mile west of this junction and walk to the south through grassland habitat with scattered Big Sagebrush, looking for Grasshopper Sparrow—a local species on the plateau. In winter, you’ll find an interesting roost for Great Horned and Long-eared Owls near Lamoine by driving north on SR-172 8.0 miles to Road 8 NW (Sprauer Road). But on your way, stop in Withrow to check the Withrow grain elevators for Gray Partridge and attendant Gyrfalcon or Prairie Falcon. Turn west onto Road 8 NW and travel 6.0 miles to a ravine, on the left, flanked by dense pines in the wheat fields. Walk along the pines to search for owls and Gray Partridge. Continue north, then east, on SR-172 to reach Mansfield. Eastward from the SR-172 junction, US-2 soon drops down to cross Moses Coulee, reaching the Jameson Lake turnoff in about eight miles. After climbing back out of the coulee, look for the junction with Heritage Road (aka Road L NE) in about nine more miles (coming from the east, this is about eight miles west of Dry Falls Junction). Turn north here and go 0.7 mile to an unmarked dirt road on the right leading to Atkins Lake. In periods of normal precipitation, this large swale in the wheat fields is a shallow lake that may have water for most of the year. During one of the irregular droughts, however, the lake may be entirely dry and not worth a stop. It can be a fabulous place for waterbirds, except in winter when frozen. Thousands of geese, dabbling and diving ducks, and Sandhill Cranes are present in spring if conditions are right. Raptors can also be conspicuous—look for Northern Harrier, Red-tailed Hawk, and Prairie Falcon year round. Swainson’s Hawk is fairly common in summer. Winter possibilities include Northern Goshawk, Rough-legged Hawk, Golden Eagle, and Gyrfalcon. Bald Eagle and Peregrine Falcon occur mainly in migration. Late summer can prove attractive for shorebirds—many species uncommon or rare in the interior have been observed when suitable mud is exposed. Winter often brings Horned Larks, Lapland Longspurs, and Snow Buntings to the lake edges. Greater Sage-Grouse can be found, with luck, at any season in patches of the original Big Sagebrush habitat about four to eight miles north of Atkins Lake. In the early morning, drive the grid of roads within the rectangle formed by Road 4 NE on the south, Road 8 NE on the north, Road L NE on the east, and Road J NE on the west. 1.1 miles north of US-2. Sagebrush Sparrow is regular along this old road, which parallels the canyon, from April to July. Stop again 2.0 miles farther north on SR-17, where the shrub-steppe habitat has more native bunchgrasses and may produce Sage Thrasher and Brewer’s Sparrow. Continue north 2.8 miles on SR-17 to Saint Andrews E Road (aka Road 6 NE). Turn left here and go west three miles to the intersection with Road O NE (also reachable by driving east three miles from Road L NE). Turn north onto Road O NE and go half a mile to scope Stallard Lake from behind a closed gate. Waterfowl, Sandhill Crane (mainly April), Black-necked Stilt, American Avocet, and phalaropes are the attraction here. This is a good place for shrikes (Northern in winter and Loggerhead in the breeding season). In winter, look for American Tree Sparrows in brush near the gate. Sims Corner marks the intersection of SR-17 and SR-172, 7.6 miles north of Saint Andrews E Road (aka Road 6 NE). Sims Corner Reservoir lies just out of view to the southeast. In spring, large numbers of Sandhill Cranes may be seen from the road as they come in to or depart from this water body. The reservoir is on private property; do not enter without permission (ask at the only farmhouse at this corner). The largest remaining population of Greater Sage-Grouse in the state—about 700 birds—persists on the northern part of the Waterville Plateau. A good area for finding these birds lekking (peak season March–April) is near Leahy Junction. From Sims Corner, go north eight miles on SR-17 to the SR-174 intersection, then left on SR-17 to Road P NE (0.1 mile). Turn left and wind southward on a gravel road through hills covered with Big Sagebrush and Bluebunch Wheatgrass, watching for Loggerhead Shrike, Sage Thrasher, and Brewer’s and Vesper Sparrows from April through August. This is all private property: do not trespass. Take time to admire the views of the Cascade Range, particularly beautiful in early morning light. The 12.5 miles of SR-172 between Sims Corner and Mansfield can be good in winter for Gray Partridge, Rough-legged Hawk, Gyrfalcon, Lapland Longspur, and Snow Bunting. In summer these fields may have Northern Harrier, Swainson’s and Red-tailed Hawks, and American Kestrel. You will also hear and see many Horned Larks—doubtless the commonest breeding bird on the Waterville Plateau. Approaching Mansfield from the east, SR-172 veers left into town. Check the grain elevators in town for Gray Partridge (dawn or dusk best) and Eurasian Collared-Dove and the surrounding utility poles for raptors such as Northern Goshawk, Gyrfalcon, and Prairie Falcon, especially in winter. Residential plantings in town might have Bohemian Waxwing or Common Redpoll. Check the tall spruce trees in the cemetery on the west side of Mansfield for Great Horned Owl and crossbills, White-winged in some winters. Where SR-172 goes right (northwest) in town, stay straight on Railroad Avenue to visit Bennett Lake and Grimes Lake in upper Moses Coulee. Turn left onto Mansfield Road (0.3 mile). Follow Mansfield Road south 3.3 miles, where it curves left (east) and becomes Wittig Road, reaching Bennett Lake in another 4.6 miles. A dirt road that turns off to the left here, open only July through October, leads in half a mile to Grimes Lake. These lakes have produced many Tundra Swans, a variety of dabbling and diving ducks, Virginia Rail and Sora, both yellowlegs, Stilt, Baird’s, Pectoral, and Semipalmated Sandpipers, and other shorebird species. The cliffs and talus slopes have Chukar, Common Poorwill, White-throated Swift, Say’s Phoebe, thousands of Cliff Swallows, Rock and Canyon Wrens, and in winter many roosting Gray-crowned Rosy-Finches that forage in the fields between these lakes and Jameson Lake (1.3 miles farther south on the main road). From the dilapidated resort at the road’s end scan the waters of Jameson Lake for waterfowl—especially in migration. Bridgeport Hill Road (Road B NE) goes north from SR-172 about three miles west of Mansfield. Note the intersection in 4.7 miles where Dyer Hill Road turns left. Continuing straight ahead, Bridgeport Hill Road descends along West Foster Creek. The poorly-signed entrance to the Wells Wildlife Area’s West Foster Creek Unit (1,050 acres) is on the left in 2.4 miles. The access road (impassable if wet or snowy) doubles back sharply and descends steeply to a few parking spots (Discover Pass required). Small numbers of Sharp-tailed Grouse are sometimes found in Water Birches and brush near the stream, but California Quail are far more common. Take the rough trail downstream a couple of hundred yards to a feeder. In winter, look for American Tree Sparrows here or in the nearby cattails. Another place for Sharp-tailed Grouse in winter is along Foster Creek on the right (east) side of Bridgeport Hill Road, beginning about three miles farther downhill. Look for them “budding” in the Water Birches by the roadside from here down to the SR-17 intersection in another mile or so, and on the east side of SR-17 after you turn left and drop down toward Bridgeport. The grouse will feed at any time of day but are sensitive to disturbance, so early morning is usually the best time to find them. Common Redpolls—irregular winter visitors—may feed in the Water Birches. In 2.2 miles from the intersection make a left from SR-17 onto SR-173 and keep on it through Bridgeport, on the Columbia River. In winter, check residential streets for Merlins and flocks of Bohemian Waxwings and other winter songbirds. A Northern Hawk Owl wintered here once, too. Continuing west on SR-173, turn right onto Moe Road (5.6 miles), which runs north, then west, becoming Grange Road. In 1.4 miles, turn right into a parking area for the Bridgeport Bar Unit (502 acres) of the Wells Wildlife Area (Discover Pass required). A second parking area is 1.1 miles farther along Grange Road. The short walk from these access points down to the Columbia River can be productive for waterfowl, Bald Eagle, and scads of coots in winter. Rarities such as Yellow-billed Loon have shown up here. The scrubby growth can have loads of sparrows. Grange Road rejoins SR-173 in 0.1 mile. Turn right. Abundant brush and trees at a third WDFW access, on the right in 0.7 mile, attract passerines (Bohemian Waxwing in winter). This access also offers good waterbird viewing on the river, as do several pullouts on the right for the next two miles. 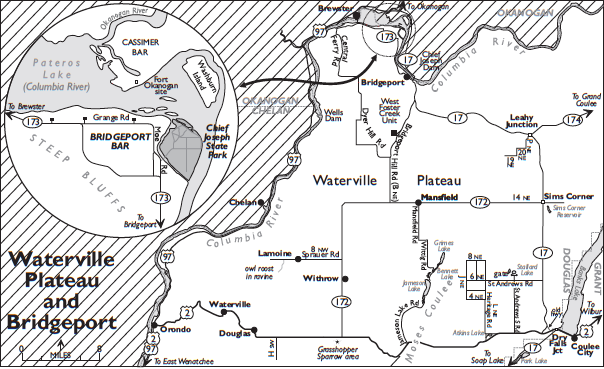 SR-173 then turns right and crosses the Columbia to Brewster and close-by Okanogan birding sites (page 432). Do not turn here with SR-173, but stay straight ahead onto Crane Orchard Road. In 2.4 miles, where Crane Orchard Road peels off to the right, stay left on Central Ferry Canyon Road, which turns to gravel, begins to climb through Central Ferry Canyon, and soon enters the Central Ferry Unit (1,538 acres) of the Wells Wildlife Area. Riparian vegetation all the way up can have good birding in winter. In four miles after leaving Crane Orchard Road, park on the right and walk the gravel road downhill on the left side of the road to a nice riparian area dominated by Water Birches and thickets of wild rose and Red-osier Dogwood, which attracts Townsend’s Solitaire, Varied Thrush, Bohemian Waxwing, and Common Redpoll in winter. Sparrows can be numerous. Sharp-tailed Grouse, though present in modest numbers, are secretive and seldom seen. Continue up Central Ferry Road and turn left onto a dirt lane marked Packwood Cemetery (0.8 mile). Park and walk this quarter-mile spur through open Ponderosa Pine forest. A fire swept the forest but habitat for birds persists. Watch for Northern Pygmy-Owl, Hairy Woodpecker, Steller’s Jay, Clark’s Nutcracker, Mountain Chickadee, White-breasted and Pygmy Nuthatches, Cassin’s Finch, and Red Crossbill. Continuing uphill, the road soon breaks out onto the Waterville Plateau. With a good map and a bit of care, you can bird your way in 15 miles or less to the Dyer Hill Road/Bridgeport Hill Road intersection.